There is always a risk of your children getting into a fight over a game with others and might come home getting wounded or rolled up in the mud. Sometimes, they might even want to get an injection to prevent any infection or a band-aid, depending on the severity of the wound. Similarly, your dog might also get into a street fight with another dog or any other animal and might end up with a dog’s bite or a severe wound. In such circumstance, you need to approach the dog very calmly because he is in pain and might oppose any touch and care. To tranquilize the pain, muzzle your dog softly so he is not frightened anymore. After the dog is quite, gently look out for the wounded area. First and foremost, if it is an open wound, try to clean and cover it to avoid any bacterial or fungal activity. If not done so, there can be puss formation or swelling in that portion. If there is heavy bleeding, find out the root and till the time your carry your pooch to the vet, apply some first-aid. 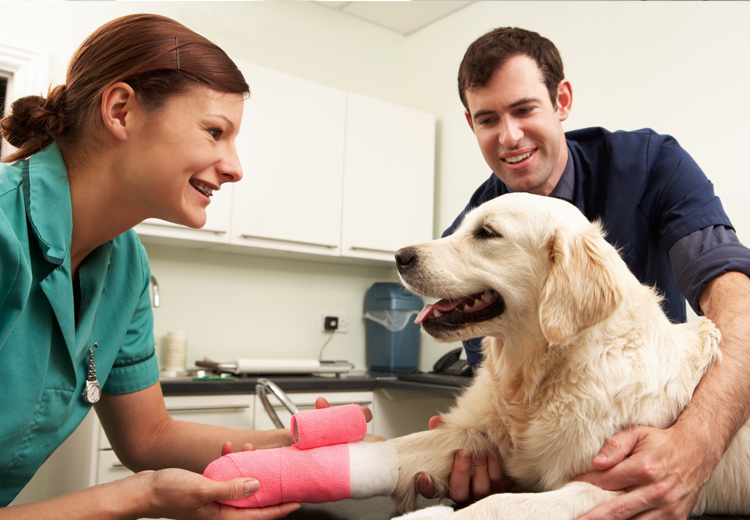 Your pet might act violently but muzzle him to clean up the wound. Use sterile gauze to apply pressure on the wound to stop the bleeding. If the bleeding starts again in 5-10 minutes, repeat the same. To see the extent till which the damage has been done, you might need to clip the fur. This will help in proper treatment and management of the wound/bite. If your are not equipped with any antiseptic or antibacterial wound agent at home, you can always clear the wound by using sterile saline solution. If your dog has a puncture wound ( circular wounds that enter the dog’s body mostly due to canine teeth ), he might be at a greater risk of infection as this wound may cause the formation of an abscess. When you realize that your pooch is suffering from a puncture wound, try and calm him, avoid licking of the wound by the dog. If the abscess is formed or there is a severe wound it will need to be closed by surgery. Else, small wounds are left open which heals themselves in time. Cuts also differ with the size of the dogs and the depth of the cut. Dogs can get cuts from almost anywhere and at any time, even while walking.